Change ppt into video with simple trick, you don't need any tools or software. Many reason people want to change ppt into video, from video formation maybe you want to show up your presentation skill at youtube or you want to make a sample powerpoint in your web. to change ppt into video formation, you can use software video cam recorder like CamStudio that can record your desktop. But the problem comes because with that camcorder, sometimes it doesn't show perfectly and also need high enough video graphic. 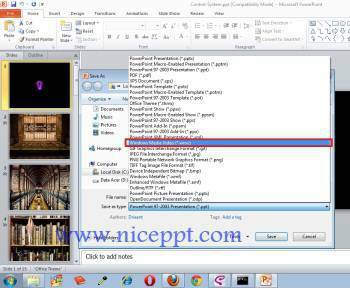 All you need is powerpoint 2010, because it have tools to save as video. so if you want to change ppt into video, you just need powerpoint 2010 or higher..
*.wmv (windows media vidio) is a video compression format for several proprietary codecs developed by Microsoft. So from that format, you can open your video and start to show up, this is my sample for you. This is one of my presentation collection that i change from ppt into video. Is that simple isn't it? I hope you can understand now how to change ppt into video.